Edward Arnold Jayne was sitting in a Fletcher classroom when he made his first visit to the French capital’s cobblestone streets. Bishop Tyrrell Anglican College students guided Mr Jayne – who was a sales representative for L’Oréal Paris for 50 years and owns a model of the Eiffel Tower – through the City of Lights on Google Street View. The school’s year 11 Information and Digital Technology students have started meeting once a term with Anglican Care residents to teach them about computers and the Internet, as part of the iTea program. The school’s food technology or hospitality students cook savoury and sweet treats. “I don’t have a computer or a tablet and I wouldn’t do it [go online], but this was fantastic,” Mr Jayne said. Anglican Care lifestyle, wellbeing and diversity manager Jane Meldrum said residents relished the opportunity to both chat with young people and learn more about how to use the Internet to communicate with their loved ones. “A lot of our residents don’t have younger family members who visit, so this fills part of that connectedness between older and younger people, the socialisation,” Ms Meldrum said. The school’s head of technological and applied studies and visual arts Mitchell Cummings said the program was “taking the IT nous the students have and doing something really good with it”. “IT support is often quite clinical but it also needs to be relational. 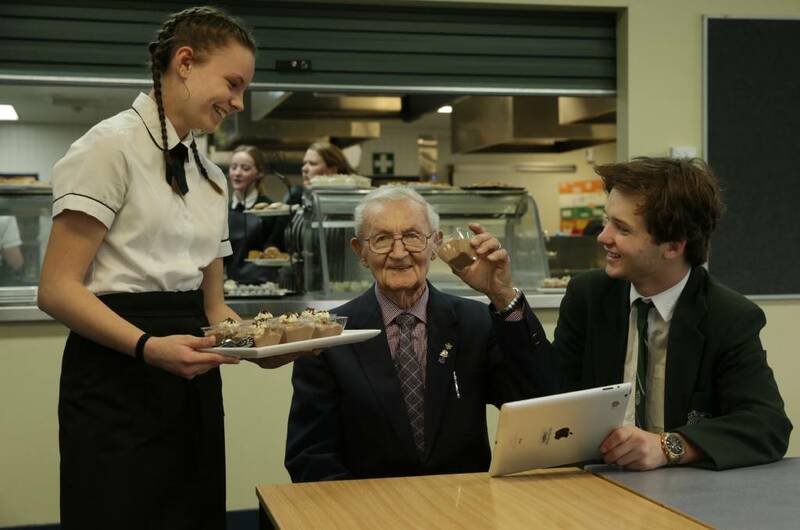 The iTea program between Bishop Tyrrell Anglican College and Anglican Care’s Intergenerational program combines information technology (IT) lessons with high tea, allowing each generation to learn from the other. The program allows the ten residents to learn new and up to date IT skills, as well as how to navigate the internet and stay connected in the safest way possible, which follows the Australian Government initiative “Be Connected eSafety” program. It is seen as a vitally important component for the students as they learn from those with worlds of life experience and a very different generation. The afternoon also gives year 10 hospitality students the chance to showcase their advanced culinary skills, which not only allows the students to work as part of a team but also provides the residents with the opportunity to have a chat with a new friendly face. This is the second ‘iTea’ session hosted by the local College and one of many to come in the coming years.